During the holiday season, nothing is more welcoming to customers and employees than a fresh, fragrant Christmas tree in your lobby or front office. If this sounds appealing – but you’re hesitant because of the work involved - GMS has the answer. We bring you all the cheer – and none of the work – with our one-of-a-kind office Christmas tree delivery service. From arrival, to setup, to takedown and cleanup, it’s a complete turnkey process offering unparalleled ease and comfort. 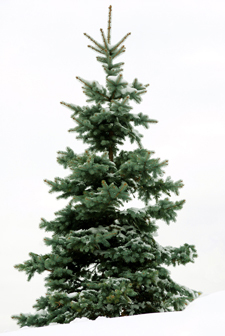 You choose your tree from a selection of balsam firs, frasier firs, spruces and pines. We’ll cut the tree and bring it to your office on the same day. We provide a tree stand, where we’ll set up and water your tree. You don’t have to worry about needles dropping all over the floor, either, because your tree is as fresh as it can possibly be. We’ll stop back after the holidays to take away the tree and clean up the area around it. It’s as simple as that. No muss, no fuss for you or your company. The holidays are busy enough for you and your business. GMS can help ensure that your office has all the decorative cheer, with no added stress or workload. Maybe you’ll even find time to sit back and enjoy the smell of the fresh Christmas tree that greets you daily. Call or click to receive a quote for the delivery of a fresh Christmas tree to your office or business.